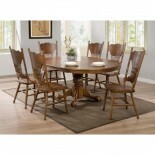 Dark Cappuccino Finish Round Table with Thick Pedastal Base Delicate Carved Detail & Genero..
Light Brown Round Table with Thick Pedastal Base Delicate Carved Detail & Generous Curves ..
Cappuccino Finished Base & Strong Tempered Glass Top Mix & Match with Different Cushion.. 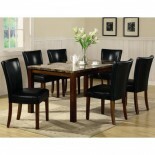 Antique Brown Finished Table Black Leatherette Upholstered Chairs Unique Planked Groove Table.. 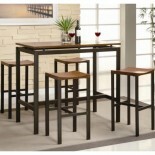 Counter Height Table with Dark Brown & Rich Black Finish Transitional Country Design with a..
Timeless Refined Classic Design with Rich Cappuccino Finish Table can be Extended from 54" to 7.. 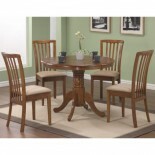 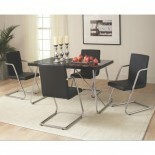 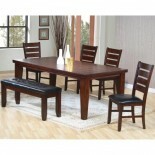 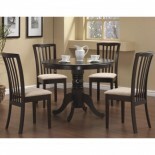 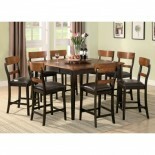 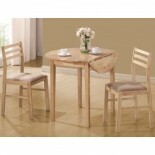 Traditional Medium Oak Finish Table with Matching Chairs Oval Top Table Design with a Double Pe.. 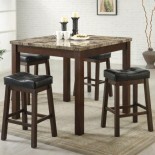 Counter Height Faux Marble Table Top Dark Brown Red Frame Finish Backless Stools with Black L..
Walnut Finished Solid Wood Table with Angled Legs Crafted from Mindy Wood Solids & Walnut V.. 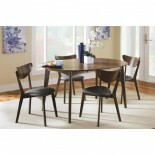 Counter Height Table with Dark Brown Finish Butterfly Leaf with Wood Glides & Tension Lever.. 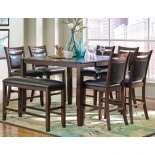 Rough Sawed Rustic Cognac Finish Planks and Rough-Sawn Surface with Exposed Knots & Na..
Casual Dining in Contemporary Style Tempered Thick Black Glass Top that's Durable & Easy to..
Faux Marble Top Warm Brown Base Finish Crafted from Wood Solids & Veneers Upholstered C.. 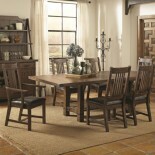 Perfect for a Breakfast Nook or Small Dining Space Round Top with Drop Down Leaves Cream Colo..
Bar Height Black Metal Table with Warm Oak Tops Birch Veneer Table Top with Matte Finished Rich..